Manila, Philippines - NBA Philippine Games is about to start in few days from posting. On October 10, 2013, NBA fans will witness Houston Rockets vs Indiana Pacers match at the Mall of Asia Arena. 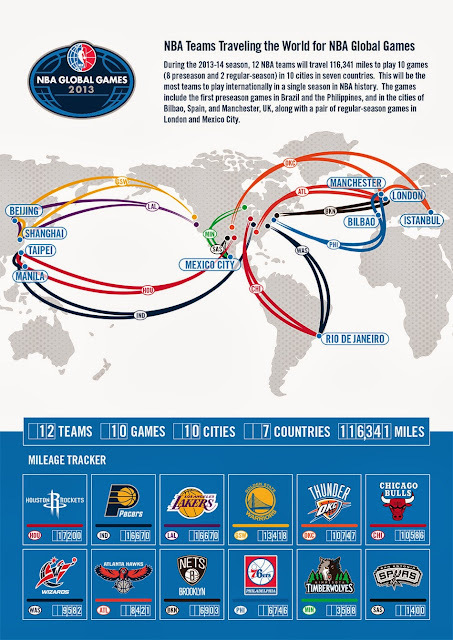 During the 2013-2014 NBA season, 12 teams will travel 116, 341 miles to play 10 games (8 pre-season and 2 regular season) in 10 cities in seven countries. NBA said that Global Games will be the most teams to play internationally in a single season in NBA history. The games include the first pre-season games in Brazil and the Philippines , and in the cities of Bilbao, Spain and Manchester, UK, along with a pair of regular season games in London and Mexico City. NBA Global Games will start on October 5 at Instanbul, Turkey (Fenerbahce Ulker vs Oklahoma City Thunder). There are 215 countries and territories where Global Games 2013 will be broadcast. There are 20 International players from the NBA participating in Global Games 2013. There is a total of 455Million followers and likes combined across all league, team, and player pages on Facebook, Twitter, Instagram, Sina, and Tencent. Following these games, the NBA will have staged 146 games (regular season and preseason) in 20 countries and territories across Europe, the Americas and Asia since 1978. NBA.com international sites will offer 14 local language and insight. There are 12 NBA Legends traveling to interact with fans around the world.